It's wedding day and the bride and groom just told you that you will give a toast during dinner. You no longer have to panic because you're an excellent toastmaster and can make up a toast just like that. For the rest of the world that isn't the case. Most people are afraid of public speaking. I fell into that category several years ago. Something to remember is that most high quality videographers/cinematographers use the audio when editing so it's important to think about what you plan on saying. I'm going to help you put together a toast that will leave your bride and groom feeling good they chose you to carry out the duties. You don't want a toasts that inappropriate, boring and long or just doesn't connect. 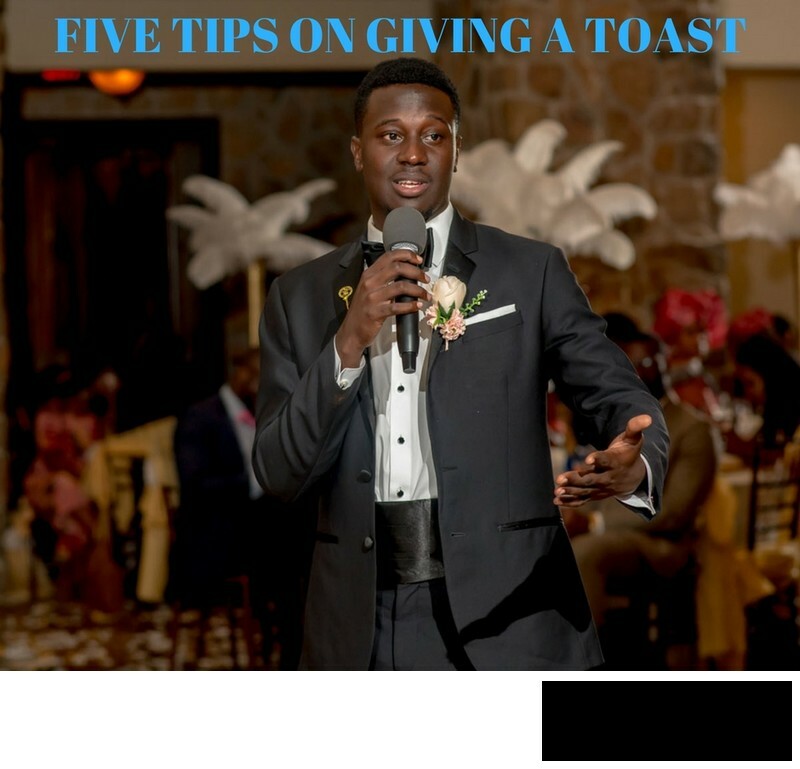 So here are five quick tips to create a memorable toast. For the most part, no one cares who you are. The main people you're toasting already knows you. So try to avoid using the line, "for those of you who don't know who I am...I've been knowing Time for........"
- This evening you will learn why Sarah is ___________. - The most interesting story about James and Sarah starts with _________. Don't rush the toast. You want to take your time and speak clear. If you are nervous, rushing will only magnify your nervousness. You've got it! The story will connect when context has been framed and you speak from the heart. When we are filming weddings, it's very annoying to have someone give a toast and watch them move back and forth or move away from the microphone. Maintain your position so that your voice is picked up in the microphone and the audio doesn't fall off and you lose part of your story. Now be a rockstar and share this page.